When I was offered the chance to review Obsession in Death, I was made aware that it was the latest in a series, but I had no idea it was the fortieth instalment! J.D. 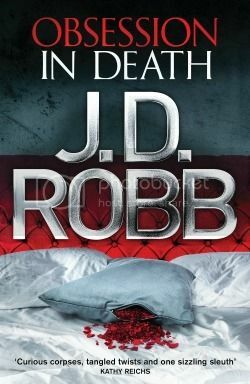 Robb, who writes under a number of pen names (including Nora Roberts), is rather prolific, and these …in Death books are very popular. The protagonist at the centre of this series is Eve Dallas, an NYPSD (New York City Police and Security Department) lieutenant. The story is set in 2060 (not something I was expecting), and follows Eve’s attempts to catch a killer. So far, so (relatively) normal as far as a crime novel goes, but Eve has a more personal connection to this particular case, because the killer is leaving messages at the crime scenes telling Eve that the murders are being committed for her. People who have wronged her are being killed, and all the killer seems to want is Eve’s recognition. Despite being the latest in a very long series, it’s obvious that Robb writes her books to ensure that a new reader can pick up the strands of the storylines very easily. The case itself is a standalone story, and it’s a compelling one. I had no idea which way it was going to go until all was revealed! Eve is a well written character, though I can’t say I found her particularly likeable for most of the story. Maybe if I had read the previous instalments, I would have been introduced to her in a more gentle way, but here, she came across as quite hard, and unwilling to display any vulnerabilities. The characters that surround her are much more engaging; her partner on the job, Detective Peabody, is engaging and fun, and I totally sympathise with her healthy eating woes. Dr Mira is a psychologist and profiler, and she is obviously a good friend of Eve’s. She’s definitely someone that I’d like to read more about in past books, and I understand she has a central storyline throughout. Obsession in Death is exactly the sort of book that will appeal to newcomers to this series, and devoted fans. There’s absolutely no reason why you can’t make it your first taste of the …in Death series, but I would imagine it’s even more enjoyable if you’ve read some of the previous stories.